Although it’s committed to the F-35, Japan may still build indigenous stealth fighters. According to reports out of Tokyo, Japan might begin indigenously building its own fighters, taking greater initiative within the framework of its defense cooperation with the United States. The news is likely to raise concern in China and elsewhere around the region that Japanese militarism may be on the upswing. Previous Japanese attempts to experiment with domestic fighters were met with resistance from the United States, but Japan and the U.S. have jointly collaborated on fighter projects, including the F-2. 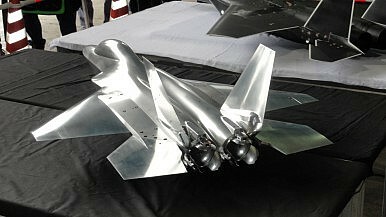 According to Defense News, Japans’ “defense ministry plans to seek about ¥40 billion ($387 million) in state funding for the next year starting in April 2015 to test experimental engines and radar-dodging stealth airframe designs for a purely Japanese fighter.” According to Tokyo’s plans, its near-term plan (over the next four years) is to study the financial viability of going with a fully indigenous program. The strategic necessity for Japan to field a robust fighter force comes from a growing perceived threat from China, which has become more assertive about its territorial claims in the East China Sea where Japan and China dispute the sovereignty of several islets. For its part, Beijing regularly warns of impending Japanese aggression, harkening back to Japan’s historical aggression against China in the 1930s. The most likely starting point for an indigenous Japanese fighter is Mitsubishi’s Advanced Technology Demonstrator-X (ATD-X). It currently exists in prototype form and has been under development for about four years. The Japanese defense ministry has commissioned Mitsubishi “to develop a stealth fighter jet,” likely based on the technology demonstrated by the ATD-X. For Japan, a major deciding factor is likely to be the cost-per-unit of a domestic fighter. One way to alleviate this would be to find foreign customers and collaborators, but Japan hasn’t indicated if it is interested in this route. Furthermore, given that Japan is already committed to purchasing the multi-role (and highly expensive) F-35, it is likely that any indigenous fighter will focus on air superiority. Given what we know about the ATD-X, it is unlikely that Mitsubishi would attempt to re-factor the design as a multi-role jet. The move fits a broader trend in Japanese defense policy under Shinzo Abe, Japan’s nationalist prime minister who was elected in December 2012. Abe has described his vision for Japanese defense policy as “proactive pacifism,” indicating that while he does not intend to fully abandon Japan’s post-World War II constitutional commitment to pacifism, he does want to modify it to meet the current needs of Japan’s strategic environment. To that end, his government recently passed a resolution reinterpreting Article 9 of the Japanese constitution to allow the country to exercise the right of collective self-defense. Furthermore, as Clint reports on the Tokyo Report, Japan is set to increase its military trade in coming years. It has also lifted its self-imposed ban on weapons exports and will export weapons to India, among other countries. In addition, Japan has signed defense cooperation deals with the United Kingdom and France this year, signaling a greater interest in defense research and development (R&D). The Key to Securing the Indo-Pacific: Japanese Constitutional Reform?Tokyo to Host 7th China-South Korea-Japan Trilateral SummitF-35 Brains in an F-22 Body: Thinking Through Japan's Next-Generation Fighter OptionsAbe to Visit US in April, Following Trump's Willingness for a North Korea SummitJapan Plans to Convert the Izumo-class Into a True Aircraft Carrier?